These features are for clients that have our Marketing Package. If you do not yet have the Marketing Package and if you're interested in having us demo it for you, please give us a call at 877-909-6699 and use option 1 for our Sales department. You can get to this part of the system by clicking on the Gear-Shaped Button on the far right side of the blue Admin Toolbar and then clicking on Settings > Marketing. This area of your settings allows you to set your branding for the automated marketing emails the system can manage for you. You are able to also decide which marketing emails will be used, and you can customize the text of these mailouts and send yourself previews of what the system will be sending. Logo - You can upload a JPEG or PNG image into this area, we recommend an image that is smaller than 1000px in its largest dimension. Brand Color - If you have a color you use in the branding of your company that you would like to see in your automated marketing emails, you need to enter the 6-character hex color code here. You can click on the square to the right to bring up a simple color picker, if you don't have your color already. Preview Marketing Emails - When you click the Send button after entering your email address, the system will send out samples of all marketing emails you have active that are possible to send. After it sends, it will pop up a small notification window in the upper right, letting you know what was sent and what might not have been able to be sent. Custom Messages - Almost all of the automated emails have default text we have loaded for you. That text is fully editable by you. You have a total of 320 characters for your custom messages, and that works out to about 50 to 60 words, so a couple of regular sentences. Top Sellers - Let shoppers know what's been hot lately and inspire more buying. 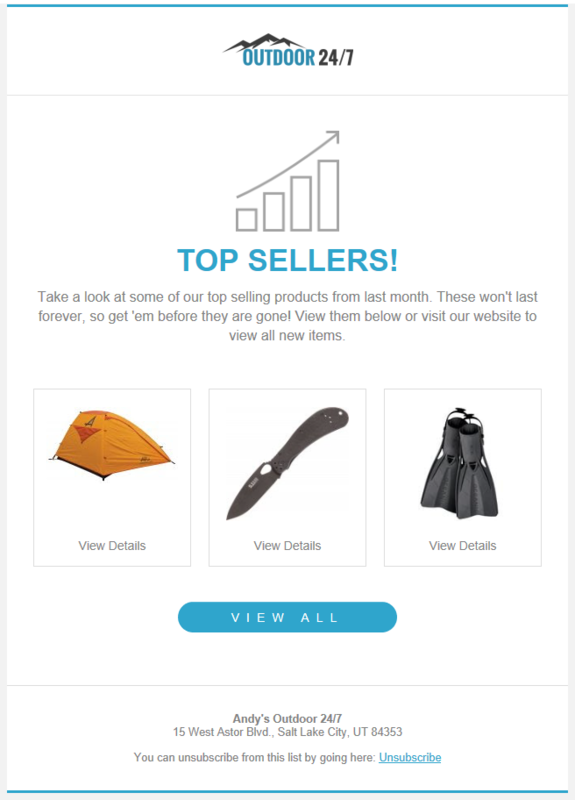 This email will feature items from the previous month that sold the most units. New Products - Feature a selection of products added the previous month. 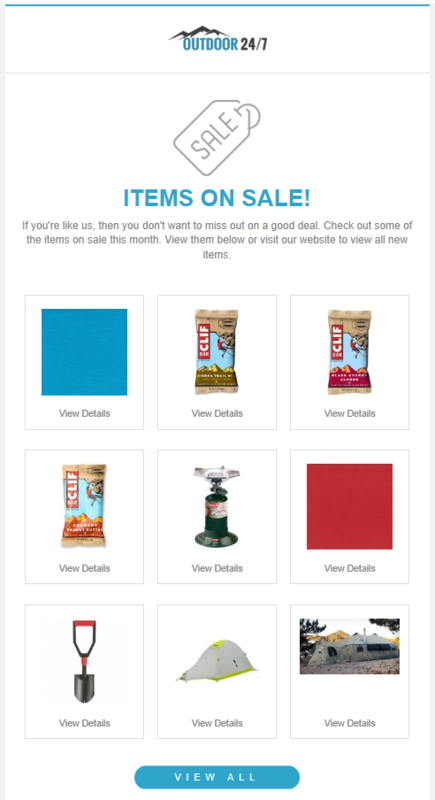 On Sale - Promote a selection of items that have sale prices saved in the system and increase views of impulse-buy items. 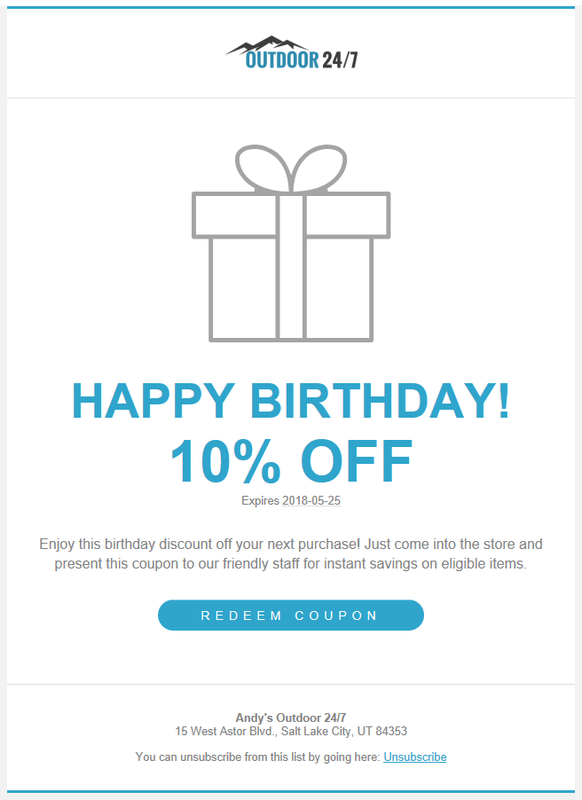 Birthday Coupon - This will send a discount coupon to customers that have birthdays saved in the system, and it will be sent on the date of their birthday. You can set how long after the birthday the coupon will remain valid (one, two, or three weeks time), the percentage discount it will give, and a custom message. 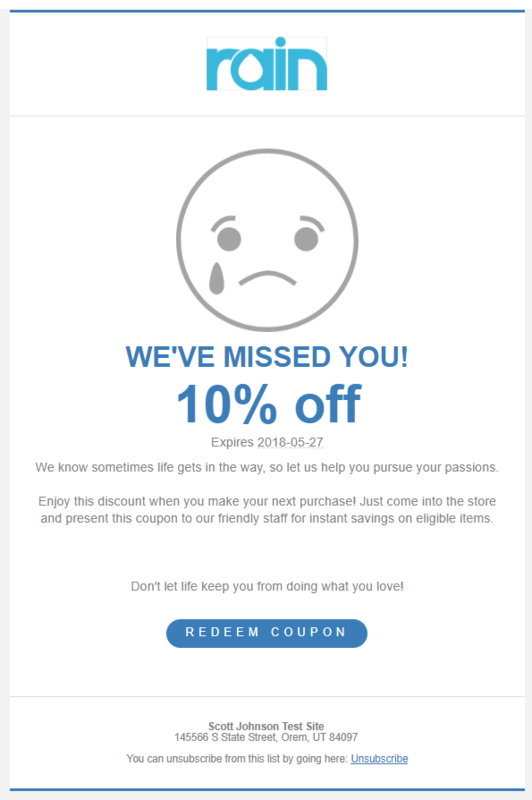 Bounce Back Coupon - This will send a discount coupon to customers the day after they purchase something in your store as an encouragement to come right back. You can set a minimum purchase amount ($10, $20, $50, or $100), expiration after the day it is sent (one, two, or three weeks time), and the percentage discount it will give. Because this is a simple encouragement to return, it doesn't need a custom message. Come Back Coupon - This will send a discount coupon to customers a certain number of days or months after their latest purchase to encourage them to shop with you again. You can set the number of days since the last purchase (30, 60, 90, 180, or 365), the percentage discount it will give, and a custom message. Upcoming Classes - This will send out a monthly reminder notifying your customers about class events on the calendar for the next three months. You can enter a custom message, if you like. Be sure to click the Save button for any changes that you made!